Teaching young children English (1-3 year olds) is a fun and challenging experience. Children at this age have a lot of energy, so they can be a lot of fun. However, it is a special challenge to harness that energy and focus it on the English lesson. My style of teaching young children is to incorporate a lot of songs, dances, flashcards, visuals and movement in general. I also mix this up with book reading time, and other activities that give the children a rest like coloring or passing around objects in a circle and saying the name. There are many things you can do. Below are some suggestions and links to songs, lesson ideas and more to get started. If you have any suggestions/ideas for me please send me an email and let me know. Teach Kids English Show Videos: Part 1 and 2 of Teaching 2-4 Year olds. In Episode #5 I talk about the basics, and in episode #6 I talk about my favorite songs for teaching this age group. There are more teaching tips videos on my youtube page. Teaching Children with Songs: Below are my favorite songs to use in class with 2-3 year olds. Click on the link to be directed to the page with the free song download. For more info on why I like these songs for this age group, please read below. Please note that some of the links will direct you to my other site freeabcsongs.com. First watch this video for an example of how I teach one of my post popular class songs. Try out the new Easy Warm Up Songs for Little Kids like Happy/Sad and Go/Stop. 2. Let's Count 1 to 10 8. What's Your Name? 6. Shapes: I See a Circle! Please check out Dream English TV for teaching tips videos for your young students. There are also song videos your students can watch and learn English! Learn how to use Flash Cards, Game ideas, dances for the songs, warm up ideas and more! New! Online Beginners English Course For Kids. Watch the videos and practice English with your students or kids! 1. The ABC Song: While this song is a little difficult at first with small children, I highly recommend teaching it from the beggining. I have heard children as young as 1 year old singing this song, at least parts of it, as it is a really catchy song. If you make a simple dance, with children waving or clapping their hands, they will really enjoy it! 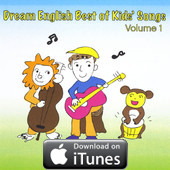 To download the Dream English Traditional ABC Song for free, click here to go to the ABC Song page. Also, I have added some fun worksheets for this song on the ABC page. 2. Let's Count 1 to 10: This song is so simple that even 1 year olds can quickly pick up the dance. I have teaching suggestions and a video on the Dream English Let's Count 1 to 10 page, where you can also download the song for free, click here to check it out. Again, I recommend the free numbers coloring sheets at MES English. 3. One Fish: Once your students get really good at Let's Count 1 to 10, I recommend this simple counting song. Kids will enjoy counting fish and cats. There are coloring sheets and matching flashcards to go along with this free download. Click here to go to the One Fish Song page. 4. It's a Dog: Children love animals, so this is an easy fun song for them. For It's a Dog lesson ideas, the free song mp3 download flashcards (dog flashcard pictured above) and more click here. 5. Head, Shoulders, Knees and Toes: A classic song, simple and kids just love it! I always start off by teaching the body parts by pointing to them and saying the name, then we sing! This song is a free download on my other site freeabcsongs.com to check it out click here. 6. London Bridge is Falling Down: Some times its good to take a break and just do something simple and fun with the kids, and this song is great for that. The traditional way to play this song is have two people (probably teachers or parents) hold their hands together like a bridge, and the children walk under it. When the verse ends with "my fair lady!" the bridge "falls" and you can hold onto the students who are under your arms. Of course, be careful! to check out this song, click here. 7. Hello Song: This is a great simple song to get your class started! Click here to go to the Hello Song page. 8. Goodbye Song: This song has a lot of actions, so it is fun for the kids. Starting at 2 or 3 years old, the children can definitely sing the song. It may sound difficult at first, but with repeated listening they can sing it! Check out the Goodbye Song. 9. What's Your Name? This is a really fun and easy name song, with only a few lyrics and a place for the kids to say their own name. Even if they can't quite say, "my name is...." they can at least fill in their own name. Catchy, I have had kids hear it once and start singing it after class to their Mom's! Check it out here. Coloring: Coloring is a great activity you can do with young children. Before we start, I always review all the colors, and have the children ask for what color crayon they want by saying, "blue, please" etc. Dream English has coloring sheets on the It's a Dog Page and the Color Song page. I also recommend the free coloring sheets from MES English. Lesson Plans: There are so many different ways to teach this age, and it really depends on your situation. Are you teaching with the parents in the class as well, with 3 or 20 kids... all situations are different. Please check out these lesson plans to get you started! If you are new to teaching using songs I recommend the Dream English Teaching with Songs Free Ebook. Check it out here. I take the Best of Kids Songs Volume 1 with me to every class! 20 Songs that are perfect for the classroom!